ITTA BENA, Miss.— Mississippi Valley State University has been continuing its work with Virginia Tech and the Sunflower County Consolidated School District (SCCSD) to increase and strengthen the impact of science, technology, engineering and mathematics (STEM) in the Mississippi Delta. Since 2015, the trio has been advancing STEM education through the program “Actualizing STEM Potential in the Mississippi Delta,” made possible through a $1.6 million grant from the National Science Foundation. As part of the program, faculty from MVSU and SCCSD have been teaming up to teach high school students in Sunflower County leadership and teamwork skills while encouraging them to explore STEM careers. Recently, representatives from each organization met for their annual workshop to discuss ideas and activities centered on ways to continue advancing STEM in the Delta. The group also discussed sustainability plans, which included launching a STEM excellence center at MVSU as early as this fall. Organized by Dr. Brenda Brand, a native of Shaw, Miss., “Actualizing STEM Potential in the Mississippi Delta” is based on a STEM initiative implemented at Virginia Tech 19 years ago. Brand said she was leaving her hometown headed back to Virginia in 2009 when she began to ponder what’s available to motivate and inspire kids in the Delta. “I realized that I’d been doing this in Virginia for so many years and had great outcomes, so I should do something similar in the Delta,” she said. After writing several unsuccessful proposals, Brand was finally funded by the National Science Foundation. For Brand, MVSU was the perfect choice. Brand, who works as an associate professor in Virginia Tech’s School of Education, said she’s all about collaborating with the K-12 system. The program provides high school students with the opportunity to plan, design, build, and program robots. 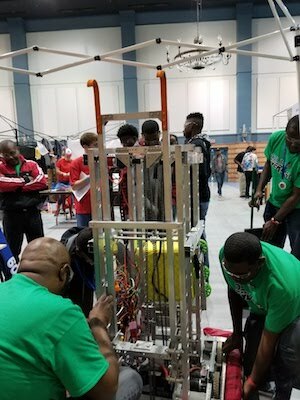 This past March, the students had the opportunity to put their skills to work as team “Delta Overload” during the FIRST Robotics Competition Bayou Regional, hosted in Kenner, La. The program also includes a mentorship component that gives MVSU STEM students the opportunity to intern at the high schools and facilitate activities related to their respective fields. In addition, SCCSD students get the opportunity to visit MVSU’s campus several times per year, which helps them become acquainted with a University setting, exposes them to MVSU, and provides MVSU faculty with the opportunity to explore innovative instructional practices. And while the program is designed to push STEM careers, Brand said she hopes that it broadens students to the endless possibilities available to them. “My determination is all around providing opportunities and influencing a positive direction for the students in STEM fields or any other positive direction for their lives,” she said.